Women account for only 34% of bike share members in the U.S. That's why Citi Bike, operated by Motivate, is launching its first-ever Women’s Bike Month in October. Our goal is to get more women biking by providing the resources and support they need to get started. October is an ideal month to ride – the weather is cooler and the scenery is beautiful. Biking is a fun way to get around the city, while adding in exercise and fresh air to your busy day. So get out there on two wheels and invite your female friends to join you! These local events, classes and group rides can help you learn about urban biking and get you started with friendly faces. Grab a friend and check out an event this month! 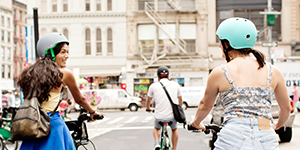 We've put together some riding tips, safety information and cycling resources for female riders in the New York City area. Check it out! For more information about Citi Bike and how it works, please visit our website. Join us in October as we celebrate #WomenWhoBike.